JERUSALEM—Longstanding political divisions came to a head on Saturday evening as key players from across Israel’s fractured political landscape stumped for their respective parties during a contentious English-language debate that highlighted the popular frustration threatening to unravel Prime Minister Benjamin Netanyahu’s governing coalition. With elections scheduled to take place on Tuesday, many Israelis are seeking a change in the country’s leadership, which has been headed by Netanyahu and his Likud party for the past six years. But with the country—and its political leaders—divided, it remains unlikely that any one political party in Israel will win big. The most contentious and pressing issues for Israeli voters are the prices of housing and food—not security, as many Westerners tend to assume. Indeed, if security were the only issue, Netanyahu's coalition would be in little danger. The right-wing parties at Saturday’s debate in the Jerusalem Great Synagogue emphasized security: Likud’s Bennie Begin warned that the left would invite danger by "putting Judea and Samaria on a giveaway table," referring to the contested lands in the West Bank. Ayelet Shaked, a lighting rod on Israel’s right, touted her Jewish Home party’s opposition to a Palestinian state, while Ashley Perry of Yisrael Beitenu emphasized that the centerpiece of his party’s platform this cycle is introducing the death penalty for terrorism. The center and left led with domestic issues. Nachman Shai of the center-left Zionist Union faction—which combines the Labor party and Tzipi Livni's Hatnuah party—stated that "when it comes to security, I think we are more or less in the same place" as Netanyahu's government. Dov Lipman, an Orthodox native English speaker of the moderate Yesh Atid party, underlined reforms his leaders have pushed as part of the current coalition to integrate the ultra-Orthodox into society. Uri Zaki, a member of the far-left Meretz party, took a line on inequality that would not seem out of place at an Occupy Wall Street rally. Michael Oren, a former Israeli ambassador to the United States and former Netanyahu ally who is now running with the centrist ex-Likudnik Moshe Kahlon’s new Kulanu party, emphasized breaking monopolies to lower prices. "We didn’t come back to this country after 2,000 years to watch it die for the price of housing and the price of groceries," Oren said. "It’s not about the nuclear threat, it’s not about Iran; Israelis believe the greatest threat to this country is the social gaps." The mounting frustration over these domestic matters was on full display, with audience members regularly booing and jeering. And while debaters were warned that the moderators would not tolerate "ad hominem attacks and rhetoric that is not appropriate," the discussion inevitably got heated at several points in the evening. When Oren criticized the current government over food prices and Shaked—whose party is led by Naftali Bennett, the minister of the economy —pushed back, the moderator lost control of the panel as voices rose to the point that the candidates were yelling at each other. Despite the gaps between the parties on domestic issues, a broad consensus emerged among the speakers about the threat Israel faces from Iran, even as Netanyahu's choice to address the topic before the U.S. Congress earlier this month proved controversial. While Oren and Shai criticized the speech's timing and venue, both made clear that they agreed with Netanyahu's substantive critique of the Obama administration's approach to negotiations with the Islamic Republic. "When it comes to Iran, we fully support the government’s policy towards Iran, except the recent speech in Washington, D.C.," Shai insisted, eliciting thunderous boos from many in the audience. "This was not the right time or place to make this speech." "To go to Washington and challenge the president of the United States" was an embarrassment "to the American Jewish community, challenging their loyalty," Shai added, drawing another round of jeers from the audience. "Nobody can question his [Netanyahu’s] sincerity in dealing with the Iranian issue," Oren fought back. "This is a person who has worked for 20 years. I’m not being ambassador … You can’t deny his sincerity." 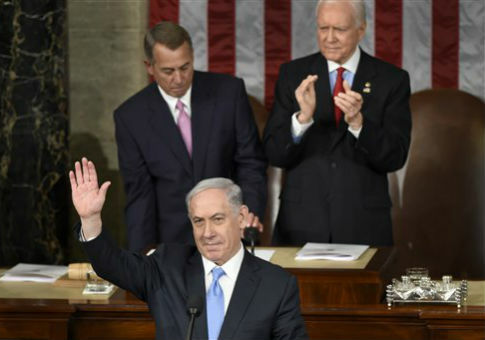 Likud’s Begin drew some of the loudest support when he defended Netanyahu’s speech. "Mr. Netanyahu created a consensus on the threat in Israel" posed by Iran, Begin said to applause. "Netanyahu demonstrated that he is, has been, a great national asset for the state of Israel with the important issues." "The importance of this [speech] was to explain to the world the agreement [with Iran] is bad," added Sheked. "Now everyone knows in the world the agreement is bad." This entry was posted in Politics and tagged Benjamin Netanyahu, Israel, Jewish Community. Bookmark the permalink. Adam Kredo is a senior writer for the Free Beacon. John Tabin is a freelancer living in Washington, D.C. John Tabin is a writer based in Washington, D.C.